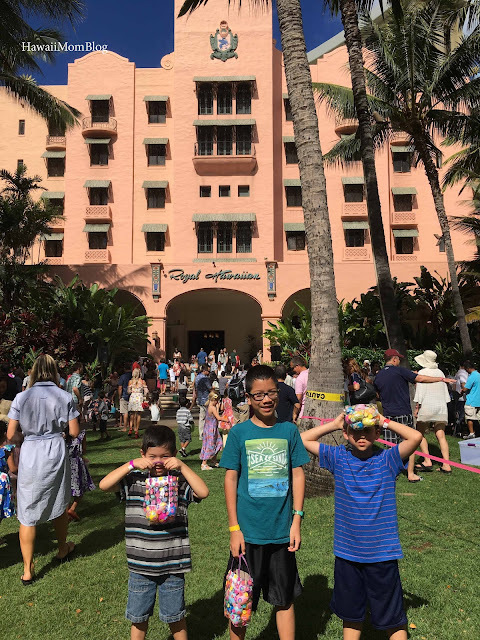 Over the weekend our family staycationed at The Royal Hawaiian, a Luxury Collection Resort, which meant we were able to spend Easter morning at this iconic hotel. 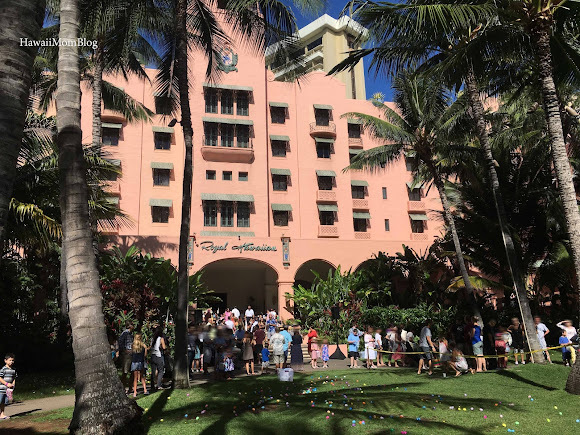 The "Pink Palace of the Pacific" was the perfect setting for a fun-filled morning of Easter activities. Easter morning started off with a greeting from the Easter Bunny! 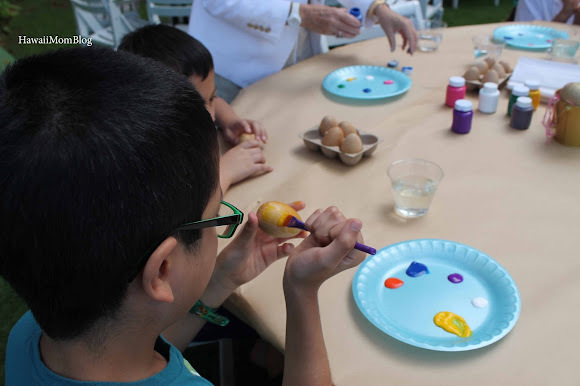 Kids were able to participate in a variety of Easter Arts & Crafts. Originally the activities were to take place in the Regency Room I, but they were relocated to the Lurline Lawn, which I thought worked out better. Even though it was a warm morning, it was just so nice to be outside! Tables were full of kids who participated in coloring, wooden egg decorating, bunny basket-making, and chick-magnet creating! The Royal Hawaiian team who assisted with the crafts was just a tiny team of two women (it was supposed to be five, according to one of the employees), and they did such an amazing job. 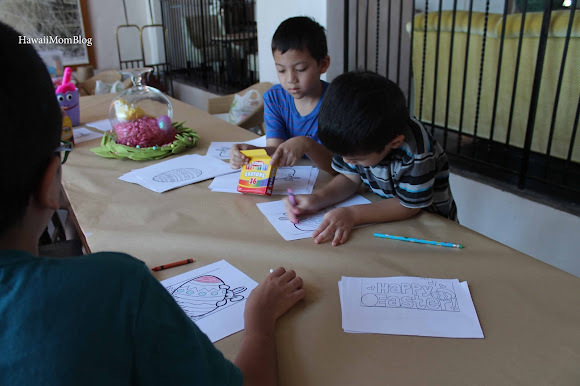 They were so helpful and patient with the kids, guiding and assisting them through each activity! 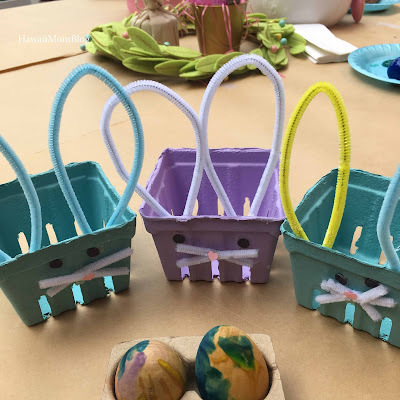 After the Easter activities, we registered for the Easter Egg Hunt. Kids were given wrist bands and were divided into several age groups. 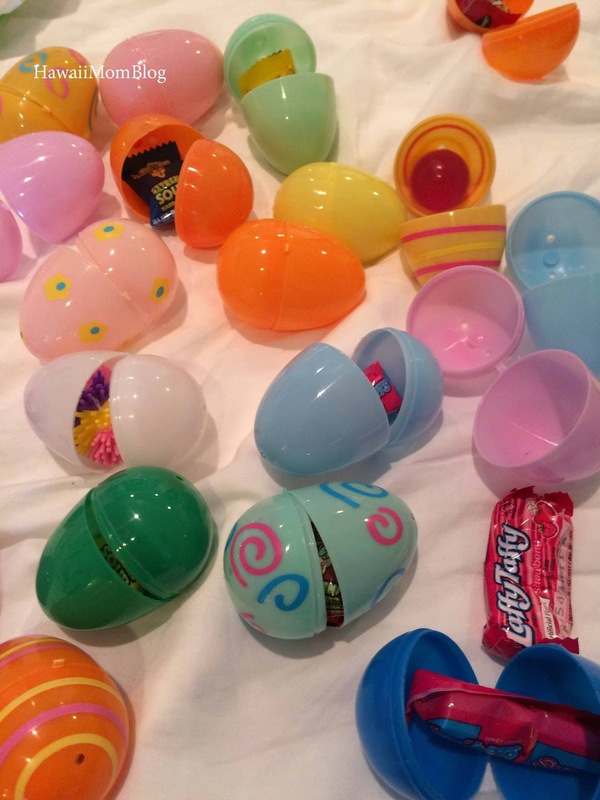 Those who didn't have their own Easter baskets to collect eggs in were given little plastic Easter bags. 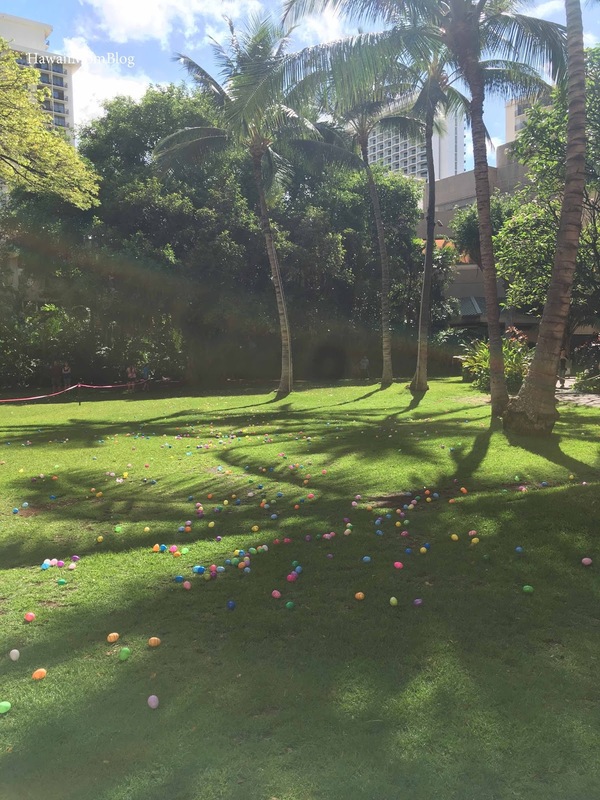 The Coconut Grove lawn was speckled with hundreds of colorful plastic eggs. 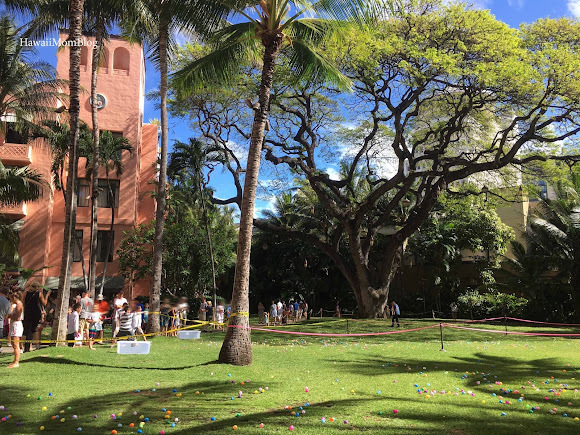 where kids of all ages eagerly awaited a chance to grab as many eggs as they could, with hopes of finding the golden egg, or an egg with a special winning message. 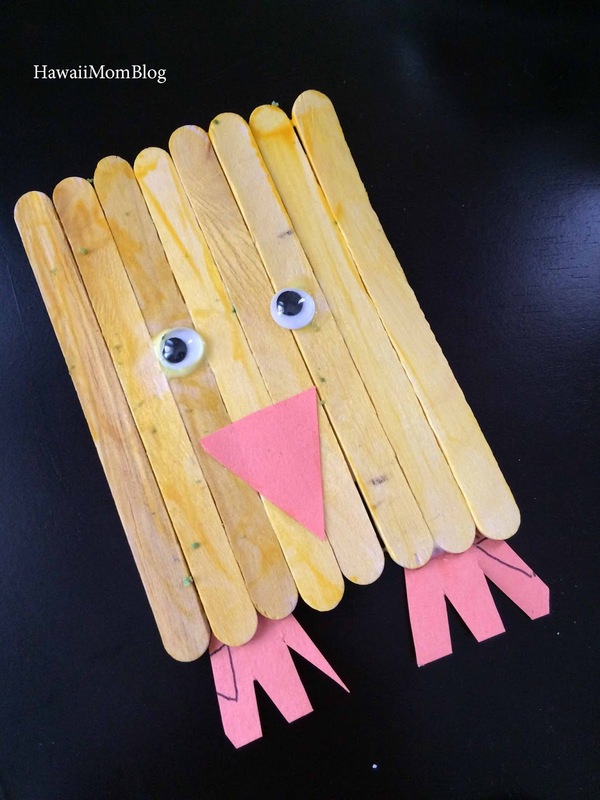 The kids were so excited that they began running for eggs before the official "go!" - it was the cutest thing! An Easter Sunday Brunch was also offered on this festive day. We didn't indulge in the brunch, but it's definitely something we'll consider for a future Easter - the menu looked amazing! The kids had such a great time celebrating Easter at The Royal Hawaiian, a Luxury Collection Resort. 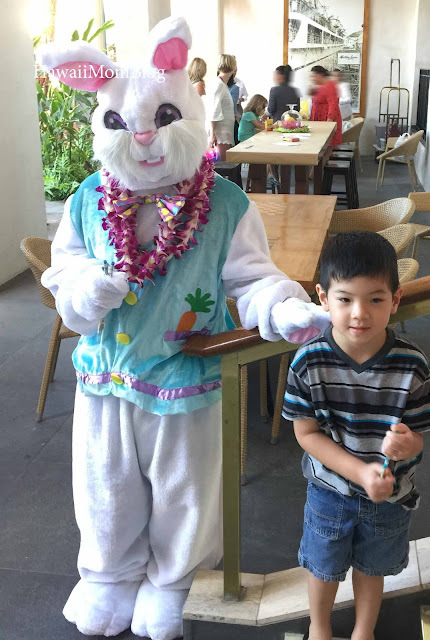 It truly was a fun and memorable Easter morning at The Royal Hawaiian. 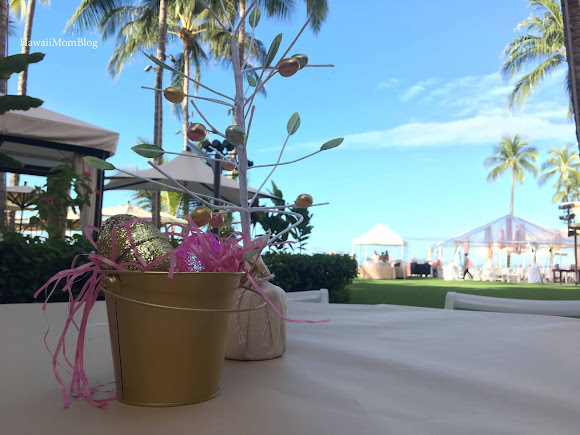 Mahalo to The Royal Hawaiian, a Luxury Collection Resort for hosting our stay.